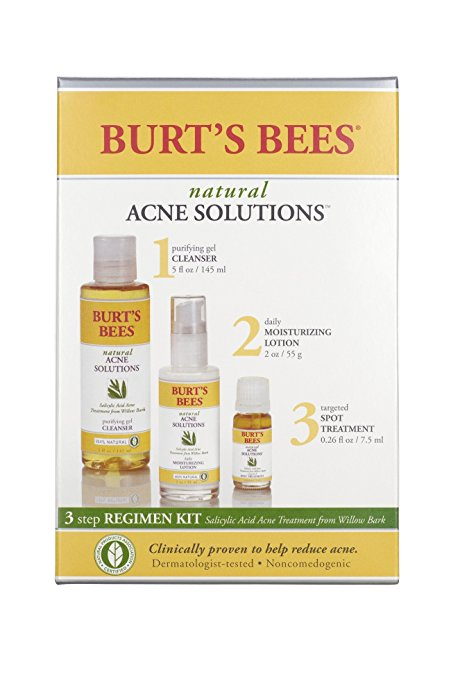 Get this Burt's Bees Natural Acne Solutions Regimen Kit, 3 Step Acne Treatment – Gel Cleanser, Daily Moisturizer and Targeted Spot Treatment on sale for $14.99 (Retail $29.99)! -SKIN CARE PRODUCTS: Fight breakouts with this 3-step acne treatment including Purifying Gel Cleanser, Daily Moisturizing Lotion and a Target Spot Treatment. -ACNE FACE WASH: Wash away all acne causing bacteria with this naturally cleansing face wash designed to control and prevent breakouts. -ACNE MOISTURIZER: Designed for acne prone skin, this lightweight moisturizer helps control oily skin and protect against blemishes. -ACNE SPOT TREATMENT: Clinically proven to improve the appearance of blemishes in 48 hours, this treatment for acne reduces redness and promotes healthy skin. -BURTS BEES GIFT SET: This gift set includes 3 Burt's Bees acne fighting face products that come in a giftable box perfect for stocking stuffers during the holidays.